Little Minds Montessori, Inc. is a Non-Sectarian & Non-Denominational program, established in January 2009 and are in a position to offer the community a quality education in Montessori Method along with before and after Child Care. Our warm and nurturing staff includes Certified Montessori Directors and Assistants having credentials in early childhood education with years of meaningful experience in working with children. Little Minds is a Member of American Montessori Society (AMS) and licensed by OCFS of New York State operating year round. Every child carries within them the person they will become. At Little Minds Montessori, Inc., we believe that the school community is responsible for discovering and nurturing the unique individual potential of each child. Our curriculum provides a sound academic background while stimulating and challenging each child to meet his or her own particular needs and learning pace. Our classrooms are rich with Montessori materials and supporting activities to promote intellectual as well as social growth. We instill through example and action a love of learning, a strong work ethic, creativity, respect and compassion for others. The philosophy upon which Little Minds Montessori, Inc. is based embraces the most fundamental teachings of Dr. Maria Montessori. Our method is designed to build upon the individual skills and knowledge acquired in the pre-school and kindergarten years. By offering multi-aged classrooms rich with Montessori materials, your child will be actively engaged in their own learning process. He or she can move through new challenging materials quickly, or on to another experience without the boredom of waiting for others to catch up. He or she can repeat these same activities until mastery is achieved. This can be done without frustration of being pushed ahead before one is ready. His or her own feelings of accomplishment act as a reinforcement to succeed. Recognize, encourage, protect, and respect the physical, emotional and intellectual individuality of each child. 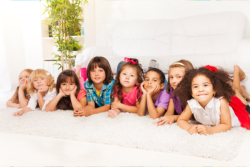 Provide a safe environment that nurtures each child’s self-esteem and creativity. Provide opportunities for children to develop according to their own capacities and interests. Offer programs that foster independence, self-confidence, and social responsibility. Provide academic opportunities to allow each child’s individual learning style to develop fully. Contact Little Minds Montessori, Inc. today at 516-612-4811, or browse our website for more information about our Montessori preschool or to view our testimonials.